NYC is a massive urban experience. So, we pitch-in and support the City’s resources with extra hands. 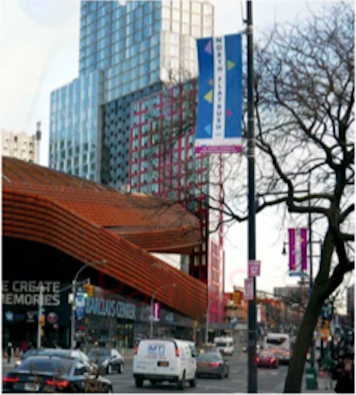 All to make North Flatbush Avenue a pleasant place to shop, dine and experience. The North Flatbush Avenue BID provides street sweeping services to assist businesses in maintaining a clean appearance along the twenty-six block faces of the commercial zone. Our street sweeper works 7 days a weeks and empties the trash in our corner receptacles for sanitation pick up. Our maintenance vendor (Street Plus) is at work seven days a week! The BID provides members with complimentary graffiti removal services for main doors and gates to create a clean and more appealing sidewalk environment for shoppers and residents. Any district property owner can contact our offices for information on graffiti removal. Let us help you get the word out! The BID provides the North Flatbush community with ongoing events, merchant workshops, speaking opportunities, street banner sponsorships, social media feeds, shopping guides and more. The BID works closely with local news outlets to spread the word about new initiatives are programs. The BID advocates for street and sidewalk improvements through written proposals to government officials. Currently, the BID is working with the NYC Department of Transportation and the Department of Design and Construction on a $60 million capital streetscape and water service project. We intend to create enhanced public spaces with planters, way-finding and benches as a quick respite for shoppers. NFBID launched the district’s most recent beautification programming on Earth Day 2016. Initially installing large-scale street planters full of blooming flowers and seasonal plantings at select intersections, the BID is expanding this project to include ongoing maintenance, additional street trees, and more locations. Sponsorship/partnership opportunities are available. Before their current home in Downtown Brooklyn, in the 1980s, the Brooklyn Tabernacle purchase the former Carlton Theater at 292 Flatbush Avenue at 7th Avenue, converting the 1383-seat theater into a church. After many years of declining membership, the church was revitalized as a non-denominational congregation, and became well know as the home of the award-winning Brooklyn Tabernacle Choir. The church remained in this location until 2002.